A couple of weeks ago I was leafing though my Rosa Mortazami cookbook looking for recipe inspiration. I came across her version of Kalam Polow. One thing that never seizes to amaze me is how many different version of the same recipe there are. 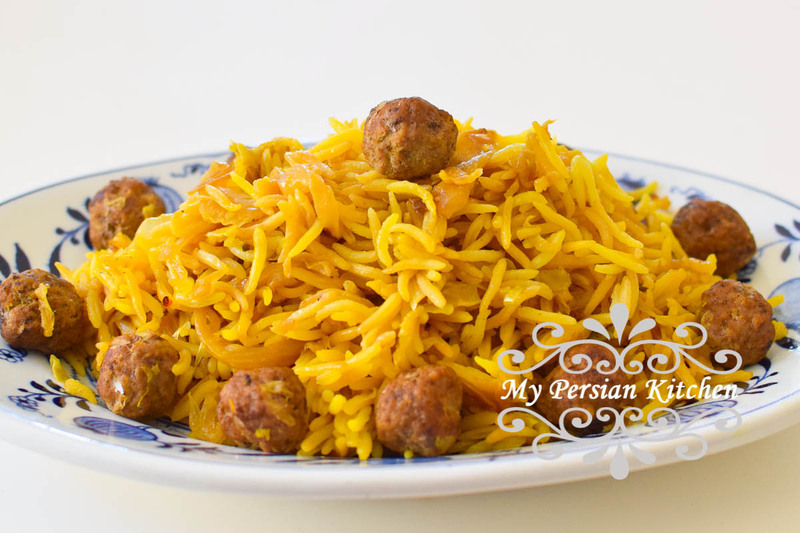 I have previously posted about Kalam Polow Shirazi and Kalam Polow Ghermez. I was immediately intrigued by this specific recipe because it it very different than the previous ones that I have personally had. I made a few minor adjustments to the recipe and I am pretty happy with the results. 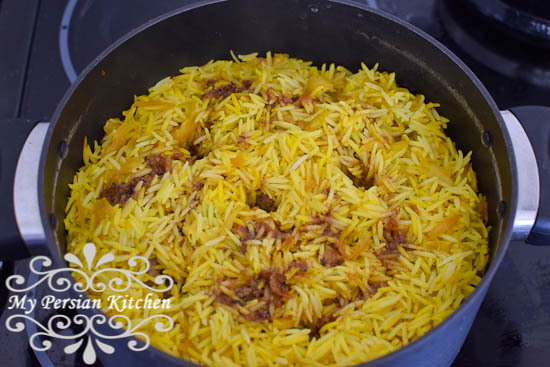 I hope you’ll enjoy this rice as much as we did! Grate 1 onion and place in a mixing bowl. Add minced garlic, 1/2 tsp turmeric, salt and pepper. Mix well. Add ground beef and mix until ingredients are well incorporated. 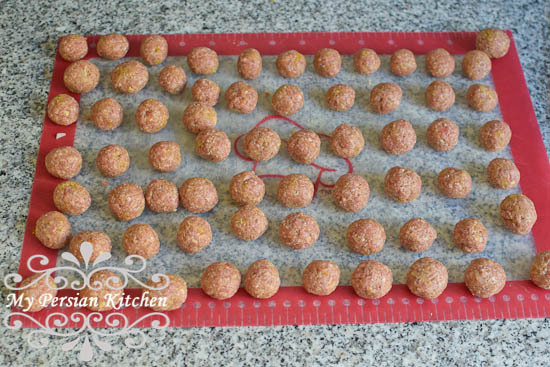 Make small meatballs about the size of hazelnuts. Cut the second onion in thin half moons. Sauté in oil until just past translucent. Add remaining 1/2 teaspoon of turmeric, mix, and continue sautéing for a couple of minutes longer. Add shredded cabbage, then season with salt. Continue cooking until cabbage is cooked. 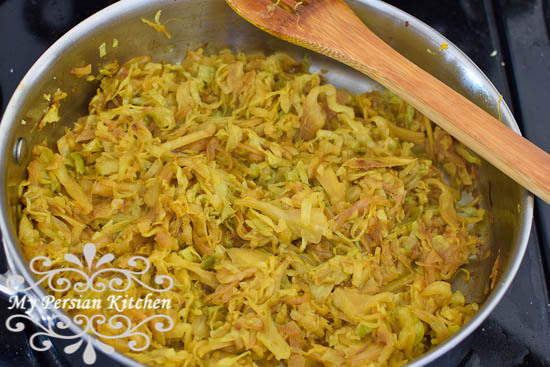 Remove cabbage from the pan and set aside. To the same pan add more oil then sauté the meatballs until cooked all the way through. Set aside and reserve the leftover juices from the meatballs and the pan for deglazing later. Place drained par-boiled rice in a large bowl. 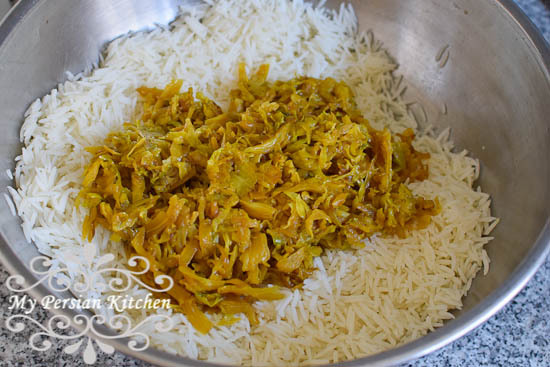 Add cooked cabbage and gently give it a quick mix. 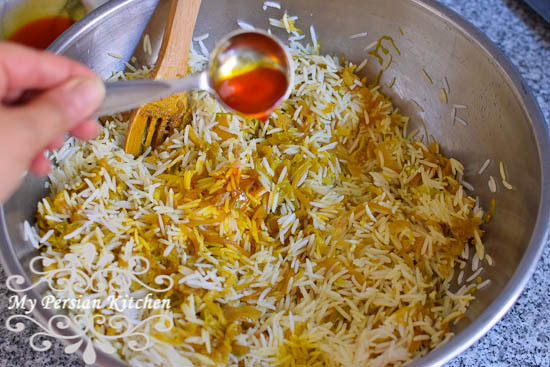 Add brewed saffron to the rice and gently mix well. To the pot add 2 to 3 tablespoons of canola oil and 2 tablespoons of water. Shake the pan. Then add one third of rice. Add half of the meatballs on top. 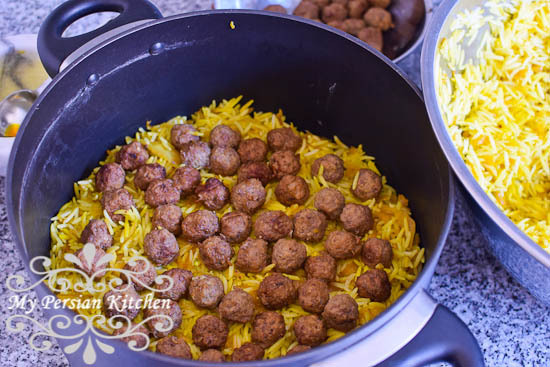 Then add half of the remaining rice, then add the remaining meatballs. Top with the last of the rice. Create five deep holes with the back of a spatula in the rice. Add 1/4 cup of water to the pan where the meatballs were sautéed and deglaze the pan. Evenly pour the broth over the rice. Wrap lid in a towel and cook on low for 1 hour. Grate 1 onion and place in a mixing bowl. 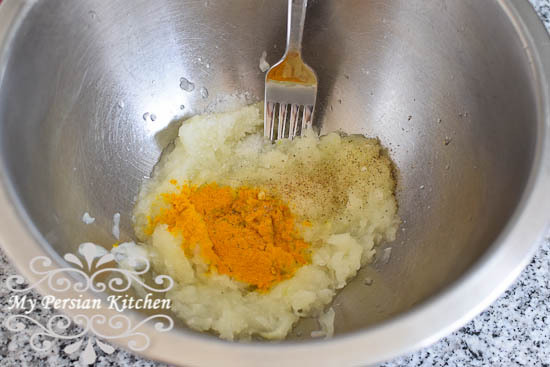 Add minced garlic, ½ tsp turmeric, salt and pepper. Mix well. Add ground beef and mix until ingredients are well incorporated. Cut the second onion in thin half moons. Sauté in oil until just past translucent. 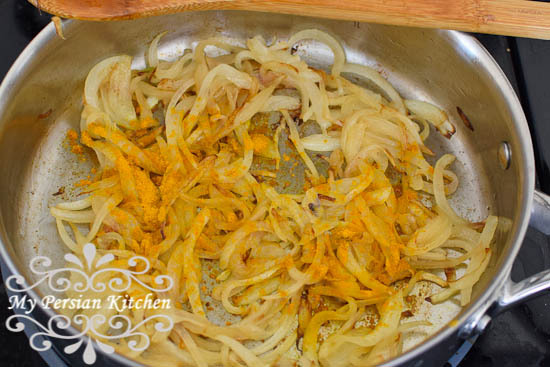 Add remaining ½ teaspoon of turmeric, mix, and continue sautéing for a couple of minutes longer. Add shredded cabbage, then season with salt. 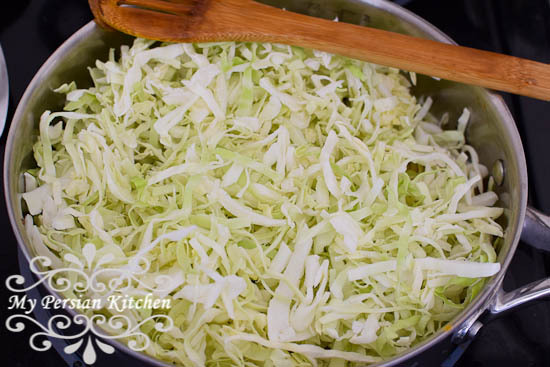 Continue cooking until cabbage is cooked, then remove from the pan and set aside. To the same pan add more oil then sauté the meatballs until cooked all the way through. Set aside and reserve the leftover juices from the meatballs and the pan for deglazing. Bring 9 cups of water to a boil. Season with salt. Add rinsed rice. Cook for 10 minutes until al-dente. 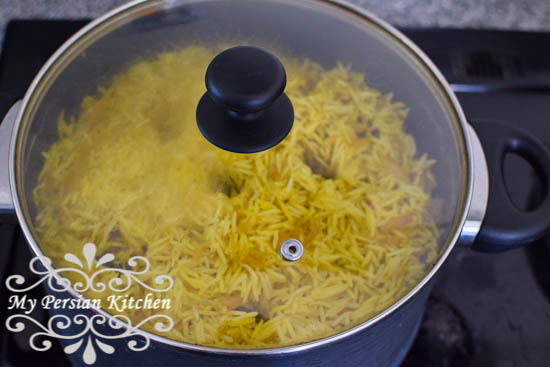 Drain rice then rinse with cold water. 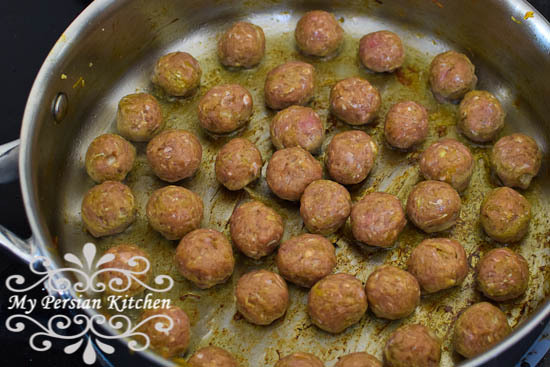 Add ¼ cup of water to the pan where the meatballs were sautéed and deglaze the pan. Evenly pour the broth over the rice. Wrap lid in a towel and cook on low for 1 hour.